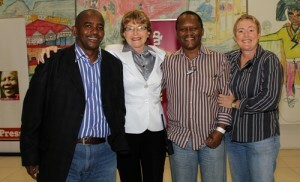 The debut TOPS Gugulethu Wine Festival was the shining star in Cape Town recently. It was hailed as a major success by the 2050 visitors, 37 exhibitors and over 120 media that attended over the two evenings on the rooftop of the Gugulethu Square Mall. The festival was officially opened by Cape Town Premier Helen Zille, who commented that you can no longer say Cape Town is not a wonderfully integrated city as one looked over the sea of people that packed the wine tasting marquee on Friday. She thanked co-founders Mzoli Ngcawuzele and Lungile Mbalo for their vision in bringing people together in wine and spent an hour walking, talking and taking questions. This is the start of a new dawn for wineries and Cape Town’s new consumers. The 2050 visitors to the festival are future wine consumers and this event, together with the Soweto Wine Festival, is the Cape Wine Academy’s vision of wine education coming to life. It is a sobering certainty to South African Wineries that they have a very large, very smart, new wine-loving market and they are just across the road and they must adjust their marketing campaigns to include wine festivals like Soweto and Gugulethu and speak to this market directly. Who knows? Maybe we can have a garagiste tasting event in Gugs next year! Augusta will be there.